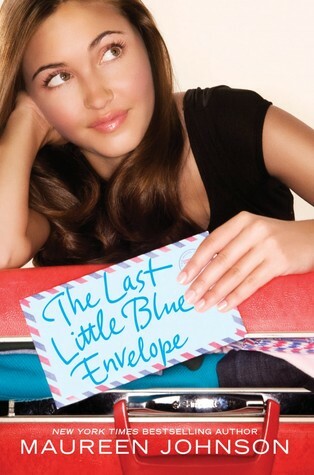 I finished Maureen Johnson’s The Last Little Blue Envelope this morning at the bookstore. The premise of the book is this: Virginia (the main character) spent all last summer hopping around Europe (starting in England), following the instructions in thirteen little blue envelopes her artistic Aunt Peg left her before she died of cancer. Only in Greece, before she had a chance to read letter number thirteen, her backpack was stolen. This story begins when she is contacted by Oliver, a boy in England who somehow found the letters and wants to get them back to her. Now, Ginny finally has the chance to read (and comply with) that last little blue envelope. Which led to me being annoyed all night. I even had dreams about how the book might have almost ended. Coupled with a migraine and insomnia, this is not something I’d recommend to any of you in the future. But I will tell you–I now have an inking of how Virginia felt when she couldn’t get her hands on that little blue letter. Books like this make me want to do a complete 180 and leave fairyland to write contemporary YA…but I’m not sure I’m ready for that yet. We’ll see. Right now, I’ll just be glad that I have John Green and Maureen Johnson to keep me occupied. And, goodness, how reading this book made me miss England. Maureen is there right now (I stalk her on Twitter), and I am excessively jealous. Yes, I am very glad I didn’t marry that lying, cheating citizen of the United Kingdom I was engaged to that one time, but a part of me is still sad that I had to lose a country in the breakup. I miss my England, with its cream tea and its traffic circles that go clockwise. I still have friends there, and a promise of a football game and Guy Fawkes Day…and Dulles airport is RIGHT HERE and I’m so incredibly tempted sometimes to break my bank and hop over the pond just to wave and play hopscotch on the cobblestones and throw a penny in Trafalgar Square fountain and fly right back home again. But, unlike that Virginia, I do not have thirteen blue excuses and a tidy little bank account. So for the meantime, I will stay here in this Virginia and enjoy the bookstore’s weighty population of British customers, and dream. Assuming I can sleep tonight. This entry was written by Princess Alethea and posted on July 31, 2011 at 7:37 pm and filed under Reviews. Bookmark the permalink. Follow any comments here with the RSS feed for this post.